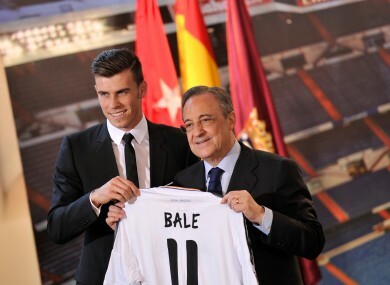 Bale and Perez at the player's unveiling. FLORENTINO PEREZ, PRESIDENT of Real Madrid, has claimed Manchester United were ready to rival them for Gareth Bale’s signature. Bale completed a world-record move from Tottenham to the Spanish club in September following the conclusion of a lengthy close-season transfer saga. But, while Perez has insisted the winger was desperate to join the club he supported as a child, he has also revealed that the Premier League champions were preparing a rival bid. Bale was cheap,” he continued. “The signing of Gareth Bale is the model of Real Madrid, signing the best player in the world at this moment, and that is what I say. Bale is currently suffering with a thigh injury that forced him out of the starting XI for Real’s clash with Getafe on Sunday. He will miss Wednesday’s trip to Elche as a result and is a doubt for the Madrid derby on Saturday. Opinion: Have the FAI gotten us into another fine mess? Email “Real Madrid president insists Bale was 'cheap'”. Feedback on “Real Madrid president insists Bale was 'cheap'”.